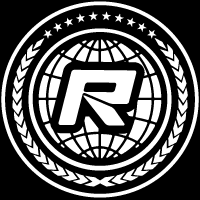 What started as what appeared to be “just another” racing class turns into a new hot trend as it seems: the four letters “CORR” (Championship Off Road Racing) take the RC-Car racing scene by storm and once again it was Traxxas that started it all. This time with the help of the Slash called 2WD racing truck. How will it perform in the European winter? The so called short course racing trucks may be nothing new to you if you live in the US and know the ‘stadium trucks’ for ages. 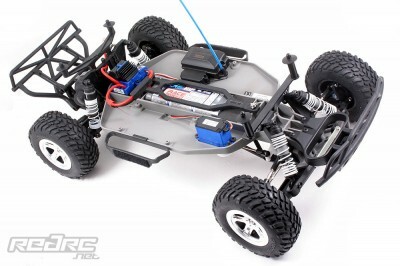 All others may be aware that the CORR racing series is possibly the world’s only full scale racing class that seems inspired by RC-Cars – not the other way around. The most fascinating fact about CORR is that the series is run on often purpose built short tracks with huge jumps, banked corners and high speed straights that look like taken straight from your local RC track. Watching a CORR race has all, if not more, of the drama you can witness in off-road races all over the world: huge high-flying off-road action, door handle-to-door handle fights and breath-taking crashes. If you want to learn more about CORR racing action, check this video. Back to the Traxxas Slash. It is a ‘semi’ replica of a full scale CORR Pro2 class truck. ‘Semi’ since not every feature of the real truck made its way into the scale model but the truck has more to offer than only a nice bodyshell inspired by the real Traxxas sponsored Jenkins Brothers Racing Team Pro2 truck. The most similarities between the two can be found up front. The Pro2 truck as well as the Traxxas Slash feature independent double wishbones which offers a wide track, huge ground clearance and loads of suspension travel. This is due to long lower wishbones and around 95mm long oil-filled shock absorbers. These feature full-plastic housings and progressive springs. The standard set-up also features 30wt oil. 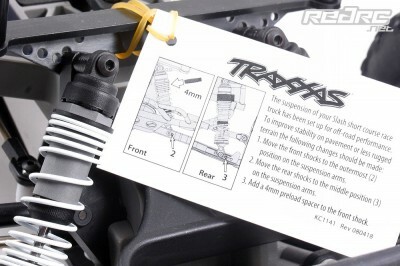 According to Steve Slayden’s Stock-Spec Racing Setup Guide on Traxxas’ website a change to 50wt oil helps smoothing the weight transfer side to side on high grip surfaces or when using the truck on a permanent race track. The wishbones are equipped with an optional hole for the shock mounting allowing the damping characteristics to be adjusted to suit both rough and smooth surfaces. The caster blocks are of a conventional C-hub style and allow for 30° of caster. 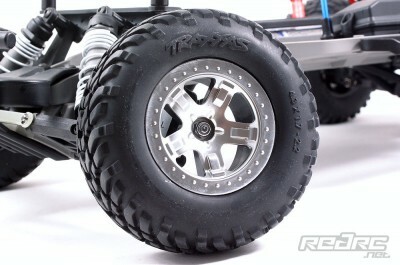 Optional alloy ones for added strength and look are available as a Traxxas option part. The outer steering blocks house ball bearings with blue seals which should withstand the rigors of bashing and racing better than the usual steel backed ones. The outer points of the chassis are marked by the very nice bead-lock style rims with pre-glued block-pattern tyres. The steering consists of a fixed double bell crank system with easy to adjust left/right turnbuckles to the steering blocks.